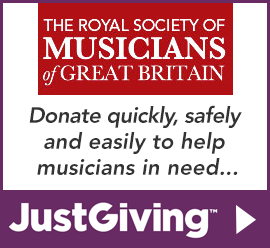 Since 1738, The Royal Society of Musicians has been working continuously to support professional musicians in need. The Society recognises the precarious nature of the freelance musician who rarely enjoys the benefits of sickness schemes and pensions and for whom, a few weeks out of work due to accident or illness, could have serious consequences both for the musician and their family. All applications to the Society are considered in confidence. Help may be offered in many ways, whether it be living expenses, rehabilitation, counselling, referrals to specialised practitioners, or consultations with financial advisors. In some circumstances, ongoing long-term financial support is offered to retired or frail musicians, as well as those with debilitating illness. In a profession where public knowledge of illness or financial difficulty has a devastating impact on an individual’s career, the Society ensures that every application for assistance is treated with the utmost discretion and sensitivity.